Sick kids are definitely not a fun thing to deal with. There is nothing worse than your baby or child waking up in the middle of the night with a fever, ear ache, stomach ache, and you don’t have that certain medicine or comfort item needed to help them to feel better. We were camping about a month ago, and I woke up to a sick boy crying with an ear ache. I went to go grab some Tylenol and I didn’t have any. GHA! I also didn’t have any olive oil which is one thing that helps a lot with my kids and their earaches. As a nurse/mom/caretaker I wanted to put together a kit/list that contains everything you need for a variety of common sicknesses, specifically for kids. I use every single one of these for various different sicknesses or ailments, especially during the winter. I had a doctor tell me that if you placed a humidifier next to your newborns crib, the chances of them getting sick decreases dramatically. Where I live the air is very dry, so this is especially helpful for those little airways. I always use a cool humidifier instead of a warm one. I use the cool mist humidifier for everything from common colds to croup. I pull it out anytime they are congested. If your toddler has a stuffy nose, or a cold this is perfect. Just be sure to dress them up warm so they don’t get chilled from the cool air. It will loosen up all of that mucous so they are better able to breathe. Can I say that technology has really upped its game in the thermometer world. I can’t count how many times my kids were screaming as I was trying to take their temperature when they were feeling crappy. Under the tongue was not even an option, so I always took it under the armpit (which usually measures 1 degree cooler). This meant taking a shirt off, holding their arm still and waiting a minute for an actual reading. How many of you have done this?? Then came in my life 2 Braun Thermometers that are AWESOME and are pediatricians #1 recommended brand! You can find them HERE or at your local Walgreens store. The first one is the Braun ThermoScan® 5 Ear thermometer. Because the ear canal is the best place to measure body temperature, this thermometer will definitely give you the peace of mind and confidence of an accurate reading compared to any other forehead or rectal thermometer. This one is used when my child isn’t sleeping or too irritable. It is very easy to use, and gives you a reading after a couple seconds. If you are holding it at the wrong angle it will alert you. Another great feature is that it remembers the last temperature taken, so you have a point of reference. Which of course is AWESOME with our mom brains! 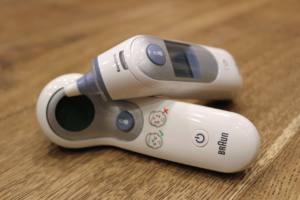 For babies, earaches, irritability, or sleeping children you can use the Braun No touch + forehead thermometer. This says it all. This is the first thermometer to professionally take accurate readings. 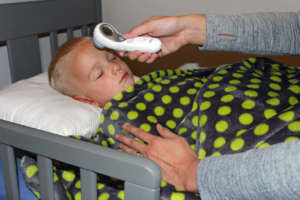 It can accurately read your child’s body temperature by lightly touching the forehead OR from up to 2 inches away. Keep that sleeping baby sleeping and it will give you a reading in 2 seconds! Even though I am a nurse I use very little medications to treat my sick kids. However, Tylenol and Ibuprofen are the 2 medications that I do use. Whenever my boys have a high fever I begin alternating Children’s Tylenol and Children’s Ibuprofen every 4 hours. This helps keep on top of the fever and works effectively together. If you only have one or the other, that is ok! Follow the directions on the box for administering and dosage. The children’s Tylenol and Ibuprofen is usually every 6 hours. Read the box instructions FIRST before administering any medication. If you ever have questions, don’t hesitate to call your doctor. This works fabulous for coughs that won’t stop. When I have sick kids who are having a hard time going to sleep because of a stinking cough, I rub this Vicks rub on the bottom of my child’s feet. It is a perfect home remedy for a baby’s cough. Afterwards I will place socks on their feet. I’m not sure how this works but 80% of the time, they stop coughing and fall back asleep. Again, if that cough worsens, go see your baby doctor. Olive oil you might ask? Olive oil is my go to for ear aches. I purchased these little dropper bottles and placed some olive oil to be put into my medicine kit. Whenever my kids have an earache, I drop a couple drops of olive oil in their ear. Stay tuned for a detailed post on how I care for earaches at home. Oh my I love love love essential oils. I have 3 that I use over and over again which are, OnGuard, Breathe, and Lavender. I use OnGuard almost every night during flu season. I rub a couple of drops on the bottom of my kids feet every night before bed. When I do this I notice a huge decrease in sickness in our home. I also use it a lot when they are or have been around sick kids. Breathe is my go to for when my kids can’t breathe! It works great to clear up those little nostrils. I use Lavender for ear aches as well by placing a couple drops on a cotton ball and placing it in their outer ear. When my sick kids begin throwing up I break this powdered gatorade out. It makes a lot, and doesn’t take up a lot of space. It is chuck full of electrolytes and you can choose how diluted it needs to be for your child. If you want to know in detail how to care for the stomach flu, throwing up and diarrhea, check this post out on How to Get Past the Dreaded Stomach Flu. How many of you had a child wake up in the middle of the night with their legs aching. We got to love those growing pains. I warm up our rice pad, give them a glass of milk, elevate their legs onto a pillow and rub their legs for a short time. This usually always helps. You can make your own rice pad or buy one here. This is the nurse coming out. 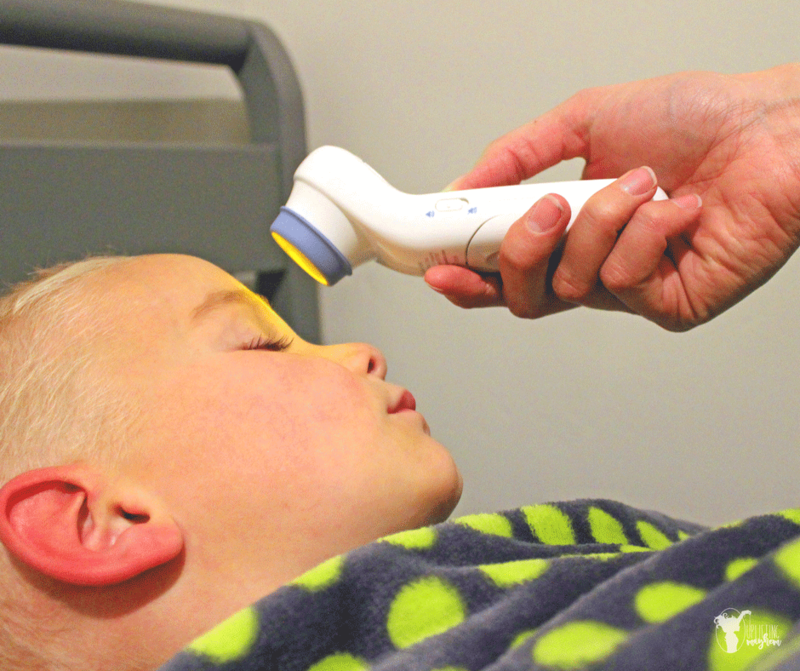 An otoscope allows you to see your child’s eardrum. This is the otoscope I have and have no complaints. I like to take care of my kids at home if at all possible. I like to see what is going on when my kids have an ear ache. 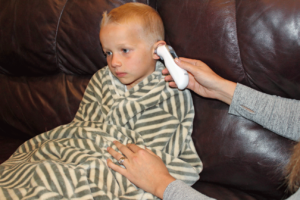 Here is a detailed post on how I treat my kids ear infections at home. I have only ever taken my boys in for ear infections 2-3 times. When my kid has an earache I will pull out my otoscope and do a quick check in their ears. Many times the ear drum is pink and we just start treating with some olive oil drops or these other methods in this post I mentioned above. There have been times where I couldn’t see the ear drum because of wax. This is when I give them a warm bath and gently spray some warm water into their ear to loosen up that wax. After I do this I start the olive oil drops. Never try to dig into your child’s ear with Q tips. They will just push the ear wax deeper. It is best to get warm water in there to loosen it up or try olive oil. My husband always calls this stuff liquid gold. I had lots of babies and toddlers that had a really hard time with constipation. I would try EVERYTHING to get my kid to poop and nothing would work. After a couple days of no bowel movement and lots of stress I finally resort to this liquid suppository. I’m not kidding, within a couple minutes they poop and life goes on as we know it! That was it! This is perfect for when your kid gets occasionally constipated. DO NOT use them too often! Your child can become dependent on them which in NO BUENO! If your child has a chronic constipation problem, then you need to go see your doctor for other methods of getting them loose. There you go! 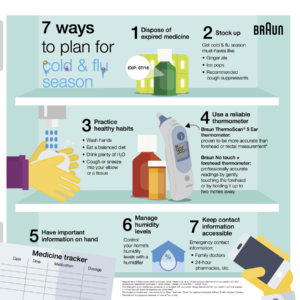 I hope some or all of these items will help take care of your sick kids at home this winter. This is a sponsored conversation written by me on behalf of Braun Thermometers. The opinions and text are all mine.